You are picked up at Lao Cai Train station. Breakfast in local restaurant and have a short rest before travelling to Bac Ha, which is 70 km Northeast of Lao Cai. The ride is relatively flat from Lao Cai to Bao Nhai, where you will be taken through rural area. 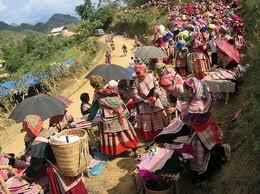 Situated in the mountains in border area, 20 km from Bac Ha, Can Cau is a small, but very colorful market. Opening only on Saturdays, it always delivers a very photogenic display of Flower Hmong, Black Zao, Phu La ethnic costumes. Chinese people also come for trading. After spending the whole morning exploring the market, you will leave the market for Bac Ha town for lunch. After lunch, you drive downhill for about half an hour. You will then start a short walk to Trung Do village, which belongs to the Tay minority. Here you can visit a traditional Tay house, before getting on a boat. You will have a cruise upstream the Chay River to experience the picturesque scenes on the river banks. You will then cruise down stream to the Bao Nhai Bridge, where you get on the car for the journey to Sapa. Check in and overnight in Sapa. After having a breakfast, you will start your journey from Sapa by car to Lao Chai village, home to Black H’mong ethnic minority people. You will enjoy a pleasant walk from Lao Chai to Tavan village, home to Dzay hill tribal people. Here you will have a rest and enjoy delicious lunch, prepared by your guide in a local house. After lunch the walk continues for about 2 hours through a bamboo forest, waterfalls and mountainous scenery to Giang Ta Chai village, home to Red Dzao ethnic group. After exploring the village and taking a rest at the nearby waterfall to refresh, you will be picked up by car back to Sapa at the end of the trip. The rest of the afternoon is free on your own leisure. Free in town until 5pm, get pick up to transfer back to Lao Cai train station for night train to Hanoi. You can have a dinner on your own at one of the restaurants around Lao Cai Station.